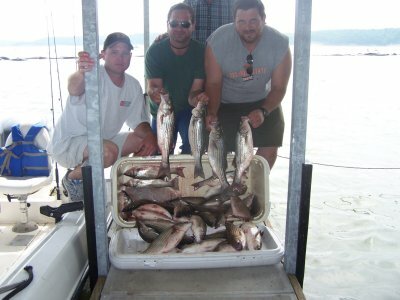 This past weekend 5/9,10,11 were good fishing days, with the fish getting bigger each trip. We limited out each time, but Saturday was a day I got one of my best box of fish in some time, all big fish, and it seemed I did a lot better than most other guides, working a little harder I guess. The fish with the Wilson group, were bigger than they look in the picture, but we knew…..Been a little windy, bait still plentiful, but great time to be out here on the water catching stripers.